Ensham Resources has been a valued contributor to the Emerald community since 1993. For the past 25 years, we have been proudly supporting regional employment and local businesses. The mine supports a workforce of approximately 625 people including employees and contractors. Our technical and operational workforce is a mix of both local residents and drive-in, drive-out personnel, allowing employees to choose where they live and work. The Ensham operation comprises one active open-cut coal mining pit and an underground mine, with current production levels of 5.2 million tonnes per annum (mtpa). The Open Cut is a dragline operation with two active draglines removing overburden. Once exposed, the coal is removed by excavators and trucks and placed on stockpiles. The Underground is a bord and pillar operation with five production units producing coal and sending it to the surface stockpile via a series of conveyor belts. The coal is transported from the stockpiles using large road trains to the coal plant where it is crushed and screened for size and then transported via rail to Gladstone Port for shipping. 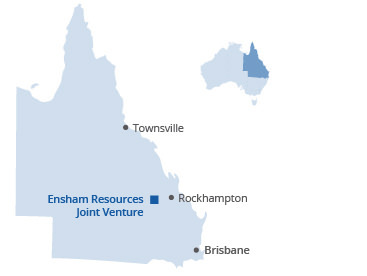 Ensham Resources is currently investigating further opportunities to expand its underground operations at the Mine. Ensham maintains a strong commitment to the environment and the local community where we operate and we actively engage with local businesses, landowners and government in order to meet stakeholder expectations.